OPOLAR offers one-year warranty against dfects. Notice: no power adapter is included due to cost and customer can use phone adapter to charge it. 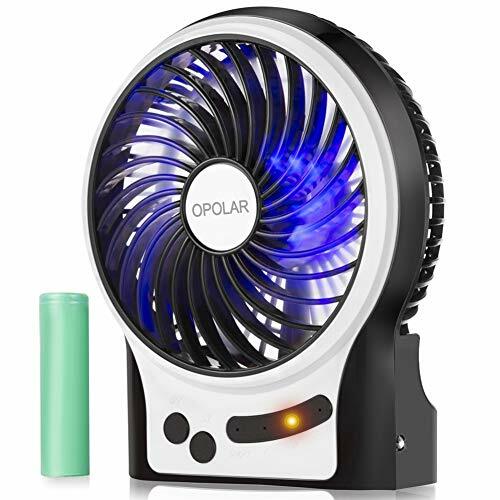 【ENHANCED AIR WIND】-Thanks to OPOLAR's latest dynamic technology, the maximal fan rotating speed arrives to 3200 rpm. More airflow, but less noise. 【3-13 WORKING HOURS AND ADJUSTABLE 3 SPEEDS 】- 2200 mAh Improved battery(type-18650) makes 3-13 hours after a full charge. The portable fan speed can be adjusted among low, medium, high according to your demands. 【USB OR BATTERY OPERATED】- Upgraded 2200 mAh rechargeable battery (included) or by being connected with a USB cable (included) even use an adapter(not included) to plug into wall socket.